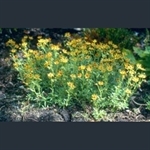 Abundant, starry orange-yellow flowers dotted red at the base. Variegated rosettes and stems with sprays of white flowers. Intensely silver-grey rosettes with white starry flowers. Lime-encrusted leaves red at the base; large white flowers. Fleshy reddish leaves and huge sprays of starry white flowers. Rosette of lime-encrusted leaves and arching stems with white flowers. Rosette with long, slender leaves, increasing yearly until arching stem flowers. 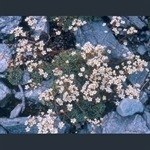 Cushions of neat rosettes with white flowers on short stems, from pink buds. Selection with rounded, lime-edged leaves; red stems with white flowers. 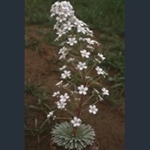 A silver saxifrage with pure white flowers. White to pale pink flowers over fresh green foliage. Rosette of spoon-shaped lime-encrusted leaves, plume of white flowers. Tight silvery-grey cushion and short sprays of white flowers. Lime-encrusted leaves and a great plume of white flowers with red spots.